89 MEMBERS. 431 HOURS EXCHANGED. Description: Free orientation for new and existing Essex Time Exchange members to review how the time exchange works. Over refreshments, meet your fellow members and arrange your first service exchange. Existing members will find the review recent software upgrades helpful. Participate in an online software use demo for basic transactions. The demo will be easier to follow if you brought a WiFi-equipped laptop along, but it is not a requirement. Please remember the e-mail address and password selected in your membership application, as it is needed to access the software during the online demo. If you have not already signed the ETX Registration Form, please print the Registration Form here before coming to the Orientation, sign it and bring it to the session. Non-members are welcometo attend. However, one cannot participate in the online demo without a registered e-mail address and password, recorded when filing a membership application. If you have not applied for membership yet and wish to join us, please submit your membership application online here before the session. Refreshments: Bring a snack to share with 5 people. Would you like to dialogue with fellow members of the Essex Time Exchange? Do you have ideas you would like to share with us all? Would you like to plan an event or activity for the Exchange? If you are a member of the Exchange, you can do so by joining the new Facebook group ETX Members created for that purpose. The group is restricted to ETX members only. If you are not an Exchange member yet, submit a membership application first and then join our new group. In a time bank, receiving services is as important as giving them. Requesting a service allows someone else to give. We wanted to share the result with you! 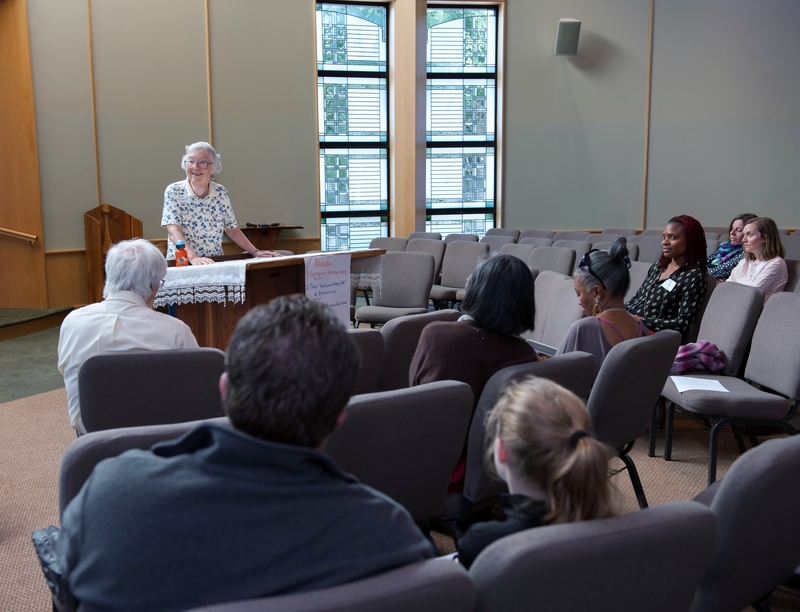 FALL TALK & MIXER -- A group of 20 people gathered on Sunday, October 5, at the B'nai Keshet Synagogue, in Montclair, to hear the talk "Living a Happy Life while Spending Little Money", sponsored by the Essex Time Exchange. Speaker Pat Kenschaft, a local organic gardener and "evangelist" for non-motorized, non-poisonous garden care, shared some of her top recommendations for living a happy life, including low-cost fun such as card games and dances as well as serious advice about keeping finances in order. High on her list was forming strong relationships with friends and community, a key theme of the event. Some of the recommendations made in the discussion that followed were: volunteer at Montclair Animal Shelter, run the laundry or dishwasher after 9 pm, join a cooperative, participate in Hillside Community Swap, use Airbnb and freecycle.org, and become a member of the Essex Time Exchange. A policy recommendation was to push for more and better public transit service in our local communities. 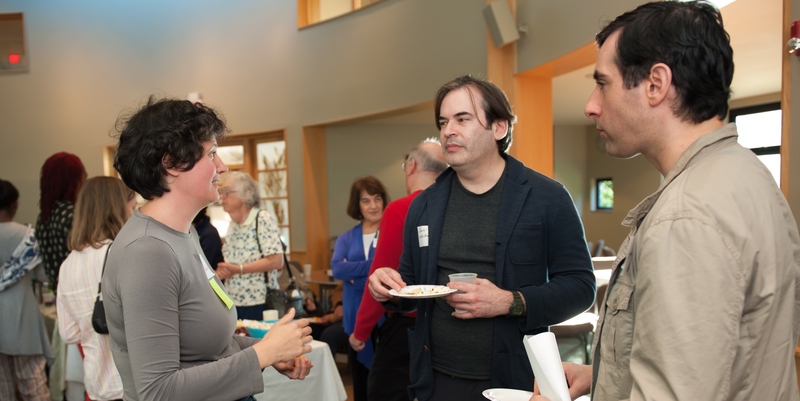 Following the talk, participants enjoyed a buffet of pot-luck snacks while talking about what motivated them to join the Essex Time Exchange, their skills and interests, and how they could benefit from the skills of others by trading services. 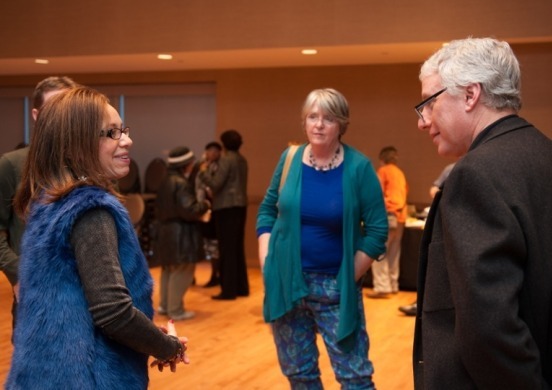 DOCUMENTARY SCREENING -- The documentary Fixing the Future, featuring David Brancaccio (of public radio’s Marketplace and NOW on PBS) and directed by Emmy-award-winning director and ETX member Mary Olive Smith, was screened in the spectacular SOPAC Loft on Sunday, February 23, 2014. We are grateful to David for being a constant friend of the Essex Time Exchange. We also thank our local partners who helped publicize the event. They are: SOPAC, The Baird Center, Maplewood on Line, Matters Magazine, South Orange Village Center, Montclair Film Festival, and Ethical Culture Society of Essex County. SPRING POTLUCK -- For the more than fifty people who came to our Spring Potluck on May 19, 2013, there was something there for everyone: member, non-member, adult, and child. The key attraction was the concert by Exchange members Danny Weiss and Mary Olive Smith, left, who performed country western and bluegrass tunes, including some of Danny's own songs. The children left the event wearing origami crowns that Exchange member Mary Kao showed them how to make. The event was held at the Unitarian Universalist Congregation in Montclair, NJ. WINTER ORIENTATION -- Twenty-five people ranging in age from 3 months to octogenarians, both new and experienced members of the Essex Time Exchange, gathered for the Orientation on February 2, 2013, when they met fellow members of the Exchange and swapped services. The event was held at the Ethical Culture Society of Essex County. Above, the group follows a hands-on online tutorial on the use of the Internet to record their time-banking transactions. The Essex Time Exchange is a free standing, independent, time bank. It provides a reciprocal service exchange among its members. Examples of services are: tutoring children, helping others with house improvements, or caring for an ill neighbor. (See more examples below.) The 'time' one spends providing these types of services earns 'time credit', or 'time dollars', that one can spend to receive services from fellow time bank members. Our members come from Essex and the surrounding counties in New Jersey (Bergen, Hudson, Morris, Passaic, and Union). One hour of one person's time is equal to one hour of another's. One hour equals one time dollar. These time dollars are earned for providing services and spent by receiving services. Upon earning a time dollar, a person does not need to spend it right away: they can save it indefinitely. Time dollars can be deducted from each account for Time Exchange overhead, in order to reimburse those providing service to run and maintain the Time Exchange. They may also be donated to support community efforts. The Time Exchange maintains an online directory of Time Exchange members and their accrued time dollars. To keep Time Exchange accounts 'balanced', the number of service hours received by any member should not exceed the hours of service offered on the average. The mechanism for balancing the credit hours is simple. Each new member will be given an allowance of four hours in her/his account upon joining the Time Exchange. When receiving a service for an hour, one hour will be deducted from the account balance. Providing a service, increases one's account balance accordingly. The table below gives examples of services that may be available through the Time Exchange. Any service would be acceptable, provided there is demand for it. How does the Time Exchange Work? The Time Exchange enables members to list the services they need and the services they can provide. By logging in above, members can advertise their offered services in the Offers List. Any member interested in receiving an advertised service will contact the offering member. If a desired service does not appear on the Offers List, a member may describe the service she/he is looking for in a Requests List. They could be contacted by any one willing to offer a service on the Requests List. This way, a member running a low account balance, could increase that balance by advertising in the Offers List or by checking the Requests List for services they can perform. Conversely, a member with a high balance would advertise in the Requests List services they could use, or check the Offers List. We expect that this practical exchange of services will build community. Once your application is processed, you will be asked to attend an Orientation Session and sign the New Member Registration Form. You can then access the Exchange online directory and start trading. An annual donation of $10 or two of your hours of service will be requested. We are now adding new members. Please go to Become a Member! (On our Secure Server) and submit your application. 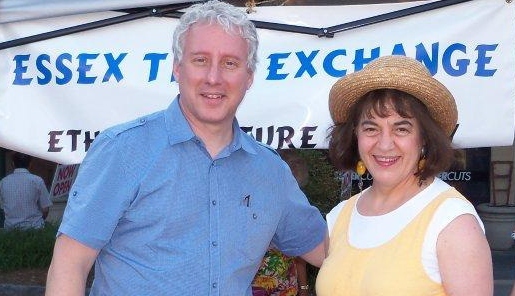 David Brancaccio, of Public Radio's Marketplace and NOW on PBS, with Essex Time Exchange founding member Mathilde Benveniste at Celebrate South Orange on June 16, 2012. SUMMER ORIENTATION On August 6, we gathered in a WiFi-equipped conference room at the South Orange Public Library to welcome new members of the Exchange and review (above) our time-banking software with them. Participants in our first openhouse learn how a service exchange works, over potluck dinner at the Ethical Culture Society building in Maplewood, NJ, on March 10, 2012. We are grateful to have been able to use for our events the facilities of the Ethical Culture Society of Essex County and of B'nai Keshet Synagogue and the Unitarian Universalist Congregation in Montclair.